Netviewer Meet Free Version is a professional web and video conferencing solution trusted by 16.000+ companies in 68 countries - now freely available for personal use. Netviewers highlights are high quality desktop sharing, VoIP and audio conferencing, chat, live video and advanced collaboration tools like whiteboard, file transfer and polling functionality. Netviewer Meet - Straightforward meetings, live demonstrations, and interactive training. 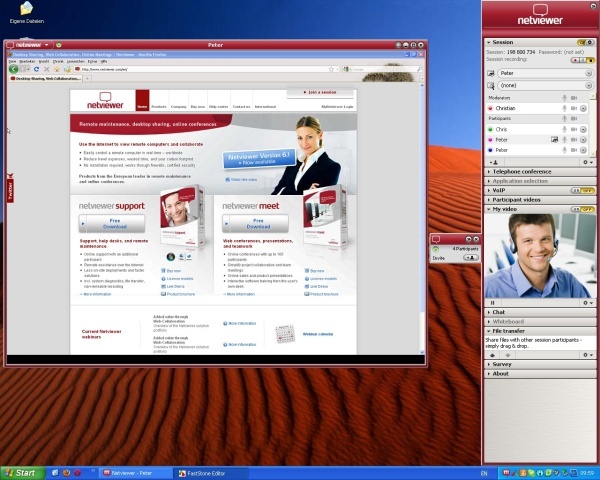 Netviewer Meet is a professional web and video conferencing solution. ...... across multiple locations, getting everyone around one table is not an easy thing to do. Fortunately there is another way. Netviewer Meet lets you use the Internet to hold meetings immediately. Your team will avoid a great deal of travel and achieve shared results faster than ever before. For example, multi-location projects will take much less time. Using the same tools, you can hold personalized discussions with potential customers, present your software on an individualized basis, or hold interactive software training events for small groups. Just agree on a time, log in to the session, and you're on your way. Participants avoid the hassle of traveling and have more time for other important things. Holding these types of sessions is incredibly easy: To enter the session, participants simply click on a link contained in the invitation. Once in, the intuitive nature of the functions lets them get started quickly. There is no need to modify the firewall or network configuration. Qweas is providing links to Netviewer Meet Free Version 6.1 as a courtesy, and makes no representations regarding Netviewer Meet Free Version or any other applications or any information related thereto. Any questions, complaints or claims regarding this application Netviewer Meet Free Version 6.1 must be directed to the appropriate software vendor. You may click the publisher link of Netviewer Meet Free Version on the top of this page to get more details about the vendor.